No school this week! My kids were so excited to discover that they got a week off for President’s Day. (I believe it’s actually for teacher furlough days, but either way my kids are home this week!) My husband and I wasted no time in planning a full week of activities. 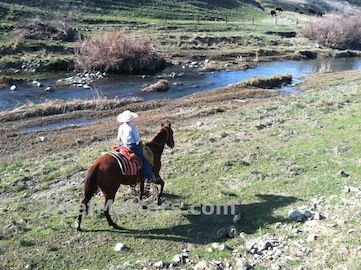 We quickly loaded up kids, sleeping bags, horses and a few other necessities and hit the road. 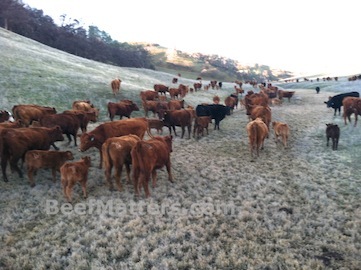 First item on our list was checking cows and moving them to a different pasture. 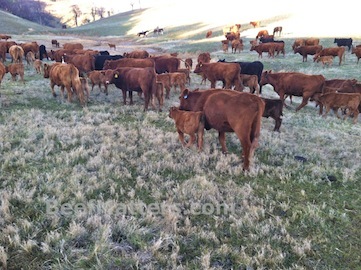 These are our fall-calving cows that we purchased last year. We have been pleased with how well the calves are doing and the mothering abilities of the cows. 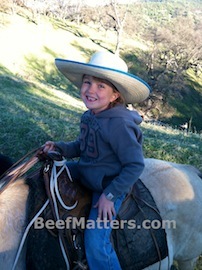 On this ride, I was struck by how much my kids have improved in their horsemanship and animal handling abilities over the past year. I found myself preparing the typical comments (okay, lectures) for them regarding handling their horses or the cattle, only to realize that they were a step ahead of me. We still have a lot to learn, but seeing improvement is always fun, especially for a mom who is convinced that her children speak a different language than their parents. Easy rides like this one provide an opportunity for the kids to observe how their horses respond to the movement of the reins and the kids’ feet. 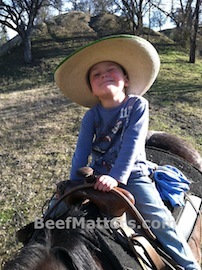 Also, how the cows respond to a posse of kids mounted on their favorite horses. 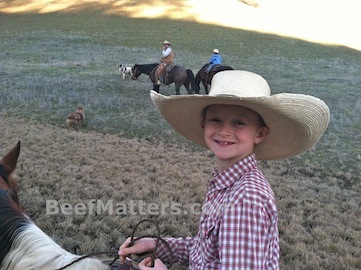 My nine-year old could see that if he rode up close to the cows the cows would speed up, but if he kept some distance between the cows and himself the cows would stay calm and walk quietly with their calves. It seems like a simple concept, but the idea of applying pressure by moving closer to the cattle and releasing pressure by backing off is fundamental in understanding how to handle cattle calmly and without undue stress in all situations. My daughter liked that the mama cows would turn around to make sure their calf was following and then they’d start down the trail with the rest of the herd. Love to see that mothering instinct. It’s always difficult to gauge how much he gleans from the discussions going on around him. I couldn’t begin to tell you if he is grasping the basics of animal handling skills, but I do know that he has perfected the art of entertaining his mother. I love it Kim! It’s great to hear about the next generation of animal caregivers.